People ask me from time to time about my boys and their personalities and whether or not they are similar. I always respond to that question with the story of their first birthdays. 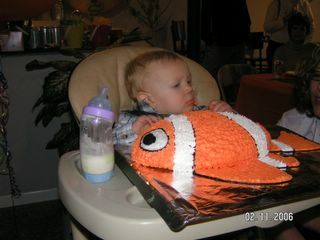 When my oldest turned one we had a Finding Nemo themed party for him, replete with a replica Nemo cake that I baked myself. When the time came for him to do the long-awaited cake dive, he simply sat in his high chair and stared at the large orange fish that had overtaken his tray. Cameras were hoisted at eye level, waiting for the mess that was sure to come. But he just sat there staring, taking it all in. I often wonder what he was thinking. Was trying to analyze how that fish got out of the TV and onto his high chair? Was he wondering why everyone was staring at him from behind cameras? Was he pondering quantum physics? 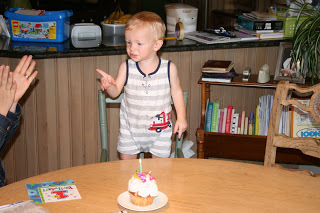 After a few minutes that seemed like an eternity, he took a single index finger and touched the orange frosting. This is it! The cameras that had begun drooping low shot back up to eye level. Now we are getting somewhere. But he just took that single index finger and slowly turned it around to look at what was creating that sensation on his finger. He stared at it for a few seconds. Then he began gently rubbing his thumb against the frosting-covered index finger in a circular motion. The crowd of photographers prodded him to no avail. Eat it. Go ahead. It’s OK. Put it in your mouth. Finally, I decided to cut him a single piece out of the cake, thinking it was clearly a matter of that big orange fish freaking him out. Surely the relentless cake eating will begin now. But it never happened. The celebrated cake demolition ended up being more like an examination, and the frosting covered one year old was nowhere to be found. 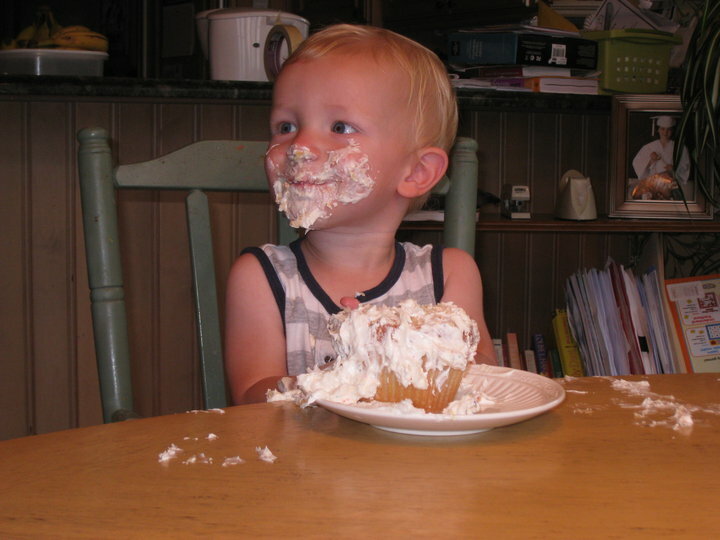 Four and a half years later, when my younger son turned one, I finally got to see the unrestrained cake demolition that had eluded us. The complete reversal was almost stunning. He was half out of his seat waiting to dive in before the plate even hit the table in front of him. 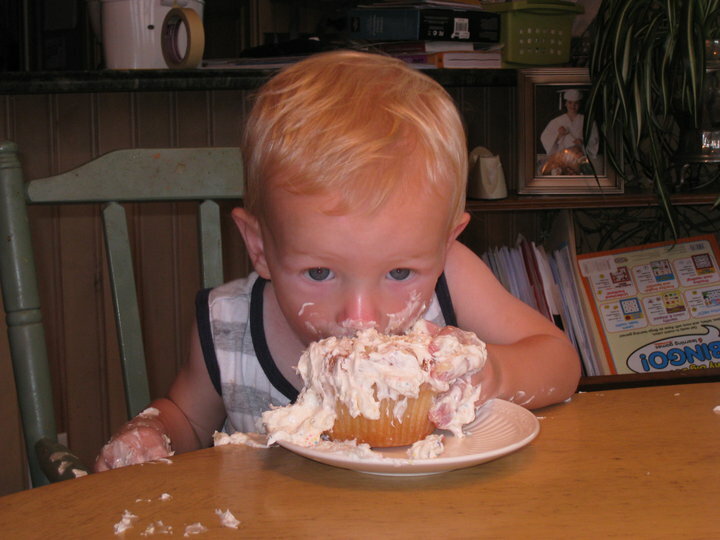 In an instant, he plunged face first into the giant cupcake sitting before him. 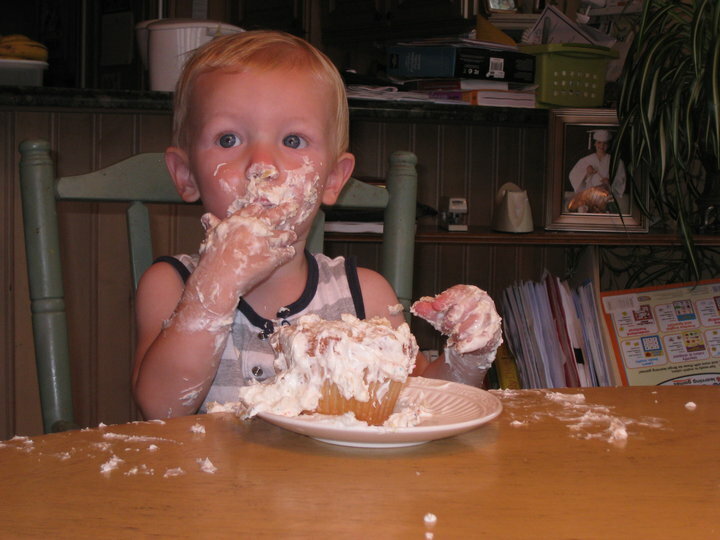 He was covered in frosting from ear to ear and up to his elbows. He was noisy, he was raucous. 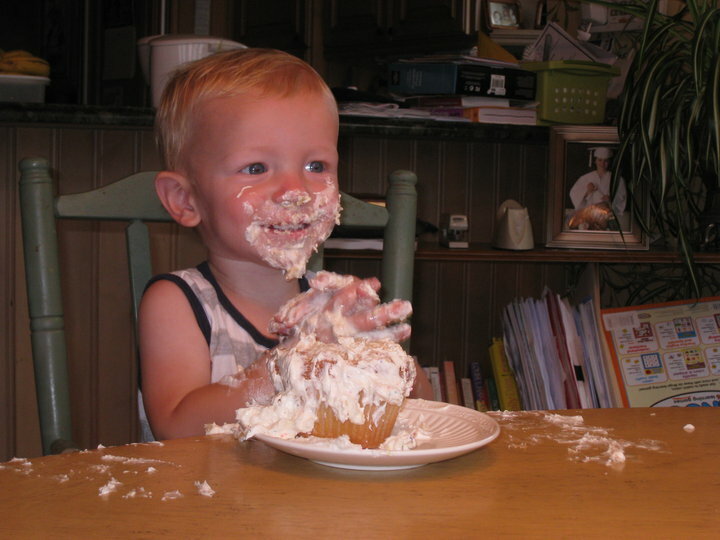 He clapped his hands and smeared frosting everywhere and completely destroyed that cake. My oldest son is still a thinker and an examiner. He is constantly taking in and processing. He loves to read. He loves history and trains. He can carry on hour long conversations with adults about religion and theology and philosophy and the expansion of the transcontinental railroad, but basic social interactions with his peers leave him feeling awkward and frazzled. He actually makes quite a bit of sense to my husband and me. We can clearly see the pieces of us in him. My younger son is still an exuberant demolisher. He loves to build things and destroy them. He loves to fight and wrestle and dance and do gymnastics. He is relentlessly physical and he is LOUD in every way, from his choice in clothing to his pounding footfall. He is a social butterfly among his peers and I struggle to keep up with all his play dates. My husband and I often joke that we have no idea where he came from, and but for the fact that he is a spitting image of my husband, may have considered the possibility that we brought the wrong child home from the hospital. 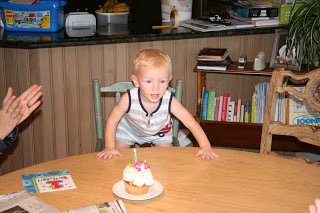 I cherish their first birthday cake experiences, because they were windows into my sweet boys’ souls. They came from the same genetic material, they were nurtured in the same environment, yet there was and always will be a part of them that stands alone. A part of them that is simply them. The people they were created to be. I pray that my boys are able to continue holding onto and trusting in the people they were created to be. Trusting in the spirit that resides in their souls. I pray even more that I am able to trust in the people they were created to be and allow them to be just that. I pray that I haven’t already muddied the waters for them, even though I know I have. We all muddy the waters. Every. Day. We listen to the world, to the people telling us we are doing it wrong, to the people telling us we look wrong or think wrong, to the people telling us we are not enough. It doesn’t take long before we begin to ignore the deepest depths of our being. We doubt that we are beautifully and wonderfully made for a greater purpose. We bury our uniqueness and start living for the world – not what the world needs, but what we think the world wants. We put on a good show, and slowly our depths are filled with murky water. Sediment begins to line the indentations and crevices that make us uniquely us. We can feel the weight of that sediment and we are desperate to clear it out, so we chase after fixes, after something. ANYTHING. The next opportunity, the next purchase, the next piece of cake, the next high, the next conquest, the next big paycheck, the next promotion, the next “like”, the next thing that we hope upon hope will clear out those murky depths and make us feel alive, whole, connected, child-like, and unconditionally LOVED again. But oh, how futile those fixes are. There is only one fix, and it is time with Spirit, with Source, with God. Time filled only with silence, where we can hear the whispers deep in our souls. You. Yes, you. You are my beloved. With you I am well pleased. There is a gift, always waiting there to be offered, waiting to wash over us like the clearest running waters. If only we can slow down, open our hands and our hearts, believe we are enough, just as we are – just who we are, and accept it.